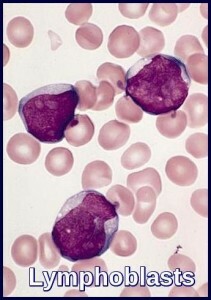 Acute Lymphoblastic Leukemia (ALL) is a malignant proliferation of lymphoblasts in the blood and bone marrow. The disease is usually rapidly progressive if untreated. The incidence of ALL peaks in childhood and then remains relatively constant at lower levels throughout adult life. Two-thirds of all ALL cases occur in children, with a peak incidence at age 2 to 5 years; ALL is the most common cancer in children and the 2nd most common cause of death in children < 15 years. In adults, this disease is less common than acute myeloid leukemia (AML). ALL is slightly more common in males. Worldwide, the highest incidence of ALL occurs in Italy, the United States, Switzerland, and Costa Rica. Anemia with weakness and lethargy. Thrombocytopenia with purpura and bleeding. Bone and joint pain may occur. On examination, lymphadenopathy and hepatosplenomegaly are frequent. A mediastinal mass may be present on CXR (T-cell ALL). CNS involvement is rare at presentation though common in late stages of the disease. 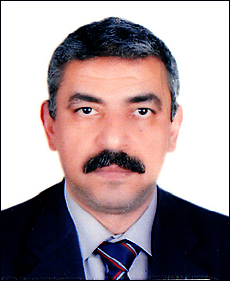 Biochemistry profile including U&Es, LFTs, Bone, LDH, Uric Acid and hematinics. 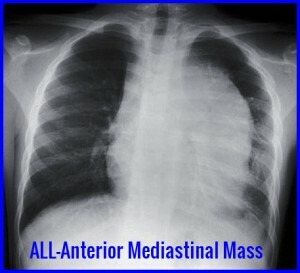 CT scan neck, thorax, abdomen and pelvis. Cultures, in particular blood cultures. Bone marrow aspirate, trephine, cell markers and cytogenetics. Anemia is usual. The total leucocyte count is usually raised with Lymphoblasts present. The neutrophil count is usually reduced. The platelet count is usually low. The bone marrow is hypercellular consisting almost entirely of lymphoblasts. Lymphoblasts generally have a very high nuclear to cytoplasmic ratio. The nuclear chromatin pattern is generally diffuse and there are one or two nucleoli which may be poorly visible. The lymphoblasts are Sudan black and myeloperoxidase negative (myeloid markers). Most cases are non-specific esterase negative (granulocytic and especially monocytic marker) although T-cell ALL may show strong polar positivity with esterase or acid phosphatase enzyme staining. The periodic-acid stain (PAS) is often positive. However, positive confirmation of lymphoid (and not myeloid) lineage should be sought by flow cytometric demonstration of lymphoid antigens, such as CD3 (T-lineage ALL) or CD19 (B-lineage ALL), in order to avoid confusion with some types of myeloid leukemia (eg, M0), which also stain negative with myeloperoxidase (MPO). Bone marrow aspiration and biopsy are the definitive diagnostic tests to confirm the diagnosis of ALL. Immunophenotyping helps to elucidate the subtype. Aspiration slides should be stained for morphology with either Wright or Giemsa stain. The diagnosis of ALL is made when at least 30% lymphoblasts (French-American-British [FAB] classification) or 20% lymphoblasts (World Health Organization [WHO] classification) are present in the bone marrow and/or peripheral blood. In addition, slides should be stained with myeloperoxidase (MPO) and terminal deoxynucleotidyl transferase (TdT), unless another method is used, such as flow cytometry. Hematoxylin and eosin (H&E)–stained bone marrow core biopsy and clot sections should also be morphologically assessed. 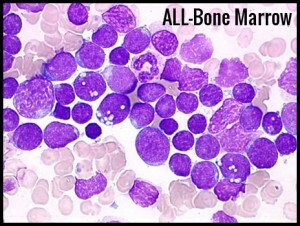 Bone marrow samples should be sent for flow cytometry and cytogenetics. Approximately 15% of patients with ALL have a t(9;22) translocation (Philadelphia chromosome), but other chromosomal abnormalities may also occur, such as t(4;11), t(2;8), and t(8;14). L1: Most cells are small with little cytoplasm and indistinct nucleoli. This is the most common variety. L2: Cells tend to be larger with relatively more cytoplasm. Nuclei often clefted with prominent nucleoli. L3: Large blasts with very blue cytoplasm with prominent vacuoles. These blasts are like those found in Burkitt’s lymphoma. This variety is rare. Chromosome abnormalities occur in approximately one-half. Hyperdiploidy is associated with favorable prognosis. The presence of the Philadelphia chromosome t(9;22) is a poor prognostic feature and is found in 10-30% of adult cases. About 10% of cases have an early T-cell phenotype (TdT positive, HLD-DR negative, CD10 positive or negative, anti-T cell antibodies positive, e.g. cytoplasmic CD3, CD7. Treatment recommendations for patients who are diagnosed with ALL include supportive treatment, induction, consolidation and maintenance therapy along with CNS prophylaxis. Supportive treatment includes transfusion for anemia, treatment of infections, platelets for bleeding, and social and psychological support. Patients should receive leucodepleted, irradiated blood products to reduce the risk of transfusion-associated graft versus host disease, cytomegalovirus (CMV) transmission, and febrile transfusion reactions. Patients usually receive packed red cells when the hemoglobin level falls below 8 g/dL, those with significant respiratory and cardiac disease might require transfusion at a higher hemoglobin level. Patients receive platelet transfusions when the platelet count is <10,000/mm3. Patients with active bleeding will be transfused to a platelet count of 50,000/mm3; patients with CNS hemorrhage should be transfused to a platelet count of 100,000/mm3. Patients receive remission induction therapy with combinations of drugs, including vincristine, prednisone, cyclophosphamide, daunorubicin, and L-asparaginase, which are given over 4-6 weeks. Remission is obtained in over 90% of children and in 70-90% of adults. Remission is defined as a normal blood count with less than 5% blasts in the bone marrow. Patients then receive consolidation (intensification) with multiagent therapy additionally, including cytarabine and methotrexate. Maintenance therapy includes 6-mercaptopurine, methotrexate, steroids, and vincristine; intrathecal methotrexate is administered throughout. Newer studies with intensive multiagent chemotherapy (ie, the CALGB [Cancer and Leukemia Group B]- 8811 and hyper-CVAD [hyperfractionated cyclophosphamide, vincristine, doxorubicin, and dexamethasone] regimens and the ALL-2 regimen) plus the addition of tyrosine kinase inhibitors (TKIs) for Philadelphia chromosome–positive ALL and rituximab for CD20-positive ALL have resulted in 3-year survivals of 50% or more in adults. Stem cell transplantation represents the most intensive post-remission therapy and potentially increases a patient’s chance for cure. Although autologous stem cell transplantation has lower treatment-related mortality than allogeneic transplantation, the relapse rate is higher than for patients receiving allogeneic stem cell transplantation. However, patients undergoing allogeneic stem cell transplantation frequently develop complications from graft versus host disease that can affect long-term survival as well as the quality of life. Prognostic factors help determine treatment protocol and intensity. Age 3 to 9 years. WBC count <25,000/mm3 (< 50,000/mm3 in children). Leukemic cell karyotype with > 50 chromosomes and t(12;21). No CNS disease at diagnosis. A leukemic cell karyotype with chromosomes that are normal in number but abnormal in morphology (pseudodiploid). Presence of the Philadelphia (Ph) chromosome t(9;22). Increased age in adults (age older than 30 years). B-cell immunophenotype with surface or cytoplasmic immunoglobulin. 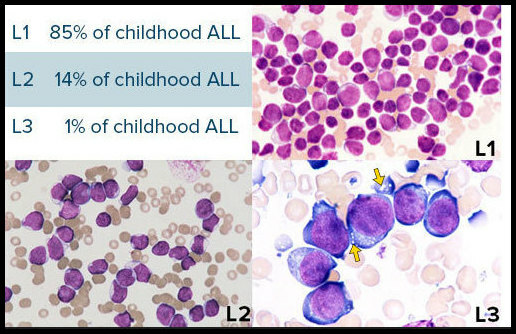 Early precursor T-cell phenotype; BCR-ABL–like molecular signature. Czuczman MS, Dodge RK, Stewart CC, Frankel SR, Davey FR, Powell BL, et al. Value of immunophenotype in intensively treated adult acute lymphoblastic leukemia: cancer and leukemia Group B study 8364. Blood. 1999 Jun 1. 93(11):3931-9. Preti HA, Huh YO, O’Brien SM, Andreeff M, Pierce ST, Keating M, et al. Myeloid markers in adult acute lymphocytic leukemia. Correlations with patient and disease characteristics and with prognosis. Cancer. 1995 Nov 1. 76(9):1564-70. Fiere D, Archimbaud E, Extra JM, Marty M, David B, Witz F, et al. Treatment of adult acute lymphoblastic leukemia. Preliminary results of a trial from the French Group. Haematol Blood Transfus. 1987. 30:125-9. Durrant IJ, Prentice HG, Richards SM. Intensification of treatment for adults with acute lymphoblastic leukaemia: results of U.K. Medical Research Council randomized trial UKALL XA. Medical Research Council Working Party on Leukaemia in Adults. Br J Haematol. 1997 Oct. 99(1):84-92. Kantarjian H, Thomas D, O’Brien S, Cortes J, Giles F, Jeha S, et al. Long-term follow-up results of hyperfractionated cyclophosphamide, vincristine, doxorubicin, and dexamethasone (Hyper-CVAD), a dose-intensive regimen, in adult acute lymphocytic leukemia. Cancer. 2004 Dec 15. 101(12):2788-801. Thomas DA, Faderl S, Cortes J, O’Brien S, Giles FJ, Kornblau SM, et al. Treatment of Philadelphia chromosome-positive acute lymphocytic leukemia with hyper-CVAD and imatinib mesylate. Blood. 2004 Jun 15. 103(12):4396-407. 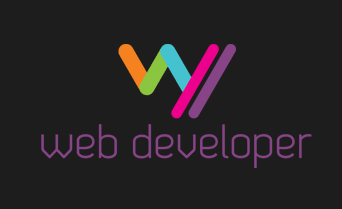 Weisdorf DJ, Billett AL, Hannan P, Ritz J, Sallan SE, Steinbuch M, et al. Autologous versus unrelated donor allogeneic marrow transplantation for acute lymphoblastic leukemia. Blood. 1997 Oct 15. 90(8):2962-8.